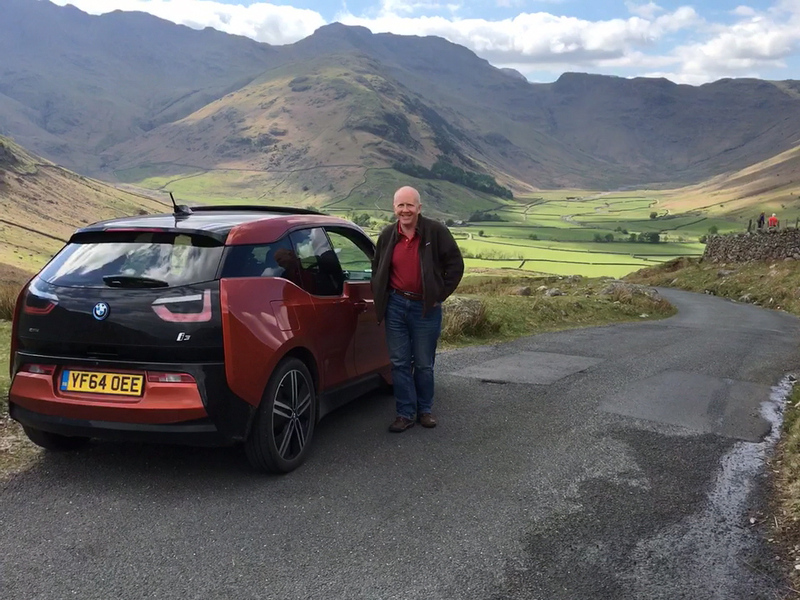 As regular readers will know, a couple of weeks ago I took my electric car to the Lake District with my friend Hap. I go there fairly regularly, but this was the first time since I got the i3, and I was wondering how it would cope. Charging points are fairly scarce there, and the gradients very different from its normal home in East Anglia. Would we get stranded somewhere on the Whinlatter Pass? In fact, I needn’t have worried. Our charming B&B in Grasmere let us plug in each night, and even though we did a fair bit of driving around, we always came back at the end of the day with more than 50% charge left. In truth, though you can spend a lot of time driving there, the distances are usually fairly small because so much of it is below 30mph (something which also helps the efficiency!) The steep uphill slopes swallow battery but this is offset somewhat by the regenerative braking on the steep downhill ones. What I hadn’t expected was just what a delight the car was to drive there! This was partly because creeping down valleys and winding over mountain passes is much more pleasing in an almost-silent vehicle (though you do need to watch out for walkers in the middle of the road who haven’t heard you coming). It was partly because it loves the corners, as a BMW should. And it was partly because the big windows and high driving position gave such a good view of the landscape. But it was mostly because of what i3 owners call the ‘single-pedal driving’: the fact that the regenerative braking kicks in as you lift your foot off the accelerator, meaning that under normal circumstances you very rarely need to use the brakes. If you know the Lakes, you’ll know there are many roads where, in a normal car, you need to move your foot from accelerator to brake on every corner. You need to change gear around every second bend. I, on the other hand, was just gliding around the corners and up and down the hills with my foot on the one pedal. No gear changes (I don’t have a gearbox, even an automatic one). No sound of straining engines, because it doesn’t make any sounds. No need to engage low gear for engine braking on the steep slopes, because engine braking is what I do all the time. I even enjoyed the long descents, because they recharged my battery. No, all in all, I spent a lot of time grinning as we drove from Grasmere to Borrowdale, from Great Langdale to Coniston, from Tilberthwaite to Ambleside. It’s the best place to drive this car, and it is certainly the best car I’ve ever driven there. I will have to try out one of these as I like quiet comfortable cars. My only hesitation would be it’s a BMW which for me I always associate with boy racers. Love the regen in my car and driving with just one foot! Sounds wonderful! Glad you managed up there. But I agree, I’m more of a Mercedes/Audi/VW man myself, but there is no car on the road quite as innovative as this. As Quentin’s traveling companion on this trip, I can attest to the accuracy of his claims, one and all. He only failed to mention that the weather was delightful. Oh, and I should have said, many thanks to Hap for the photo!